Prion protein (PrP) is a normal component of neurons, which confers susceptibility to prion diseases. Despite its evolutionary conservation, its normal function remains controversial. PrP-deficient (Prnp0/0 ) mice have weaker afterhyperpolarizations (AHPs) in cerebellar and hippocampal neurons. Here we show that the AHP impairment in hippocampal CA1 pyramidal cells is selective for the slow AHP, and is not caused by an impairment of either voltage-gated Ca2+ channels or Ca2+-activated K+ channels. Instead, Prnp0/0 neurons have twofold to threefold stronger Ca2+ buffering and double the Ca2+ extrusion rate. In Prnp0/0 neurons thapsigargin abolished the stronger Ca2+ buffering and extrusion, and thapsigargin or cyclopiazonic acid abolished the weakening of the slow AHPs. These data implicate sarcoplasmic/endoplasmic reticulum calcium ATPase in the enhanced Ca2+ buffering, and extrusion into the endoplasmic reticulum, which contains substantial amounts of PrP in wild-type mice. Altered Ca2+ homeostasis can explain several phenotypes identified in Prnp0/0 mice. Prion protein (PrP) is a widely expressed plasma membrane-associated glycoprotein with highest levels of expression on neurons and glia. It is widely accepted that an abnormal isoform of this protein underlies transmissible spongiform encephalopathies such as bovine spongiform encephalopathy, scrapie, and Creutzfeldt-Jakob disease (Prusiner, 1998; Collinge, 2001). Despite the central role of PrP in these diseases, and its evolutionary conservation, its normal function remains unclear. A proposed role for PrP is metal ion homeostasis (Brown, 2002; Watt and Hooper, 2003) because it binds copper avidly although its functional consequences, if any, are unclear (Davies and Brown, 2008). Other proposed roles for PrP include protection from oxidative stress (Brown, 2002; Krebs et al., 2007), although this is contentious (Hutter et al., 2003; Jones et al., 2005), and signal transduction (Rieger et al., 1997; Chiarini et al., 2002). In the brain, PrP particularly localizes to synaptic membranes (Herms et al., 1999; Fournier et al., 2000), suggesting a role in neurotransmission. This hypothesis supported by several reports of subtle alterations in neuronal function in PrP-deficient (Prnp0/0 ) mice. These alterations include mossy fiber reorganization (Colling et al., 1997), reduced long-term potentiation (LTP) (Collinge et al., 1994; Manson et al., 1995), decreased EPSPs (Carleton et al., 2001), and reduced synaptic inhibition (Collinge et al., 1994). A reproducible electrophysiological phenotype is a reduction in the slow afterhyperpolarization (AHP) (Colling et al., 1996; Herms et al., 2001; Mallucci et al., 2002; Fuhrmann et al., 2006). The slow AHP is a property found in many neurons, which is evoked by repetitive action potentials, can last for several seconds and reduces the likelihood of subsequent action potential firing (Lancaster and Adams, 1986). The slow AHP is mediated by a Ca2+-dependent K+ channel, the exact molecular identity of which remains elusive (Sah and Clements, 1999; Bond et al., 2004; Pedarzani et al., 2005). The observed weaker slow AHP in PrP-deficient mice has several potential mechanisms, including impaired function of either Ca2+ or K+ channels, disruption of their interaction, or altered Ca2+ homeostasis. Herms et al. (Fuhrmann et al., 2006) suggested that the reduction in slow AHP is caused by an alteration in L-type voltage-gated Ca2+ channels (VGCCs) in CA1 hippocampal neurons. Whether this mechanism is sufficient to explain the observed alterations in Ca2+ signaling in diverse cell types remains unclear. 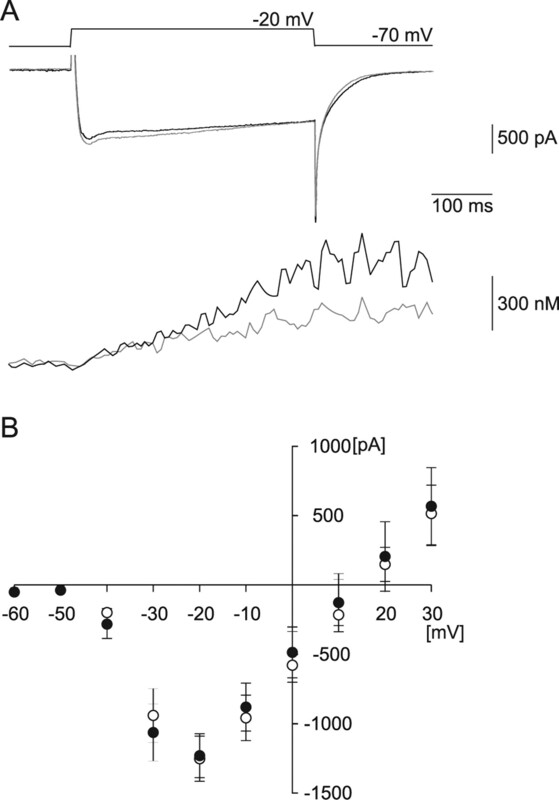 In cerebellar granule neurons, basal levels and depolarization-induced Ca2+ signals are reduced without observed alterations in VGCC function (Herms et al., 2000). Prion protein expression has also been shown to have profound effects on Ca2+ signaling in Chinese hamster ovary cells (Brini et al., 2005). In the present study, we examined the effect of PrP expression on the Ca2+ homeostasis of CA1 pyramidal neurons to find a mechanism that can explain the reduction in both Ca2+ signaling and the slow AHP. By use of patch-clamp recordings of individual hippocampal CA1 pyramidal neurons, we examined the mechanism of the reduction in slow AHP and correlated this with changes in Ca2+ signaling. Origin and use of Prnp0/0 mice. Mice were bred at the University of Birmingham from progenitor mice supplied by the Medical Research Council Prion Unit (London, UK). Two groups of mice were used: homozygous PrP-null (Prnp0/0 ) and wild-type controls (Prnp +/+). The PrP-null mice were generated from “Zurich 1” mice (Bueler et al., 1992), fully backcrossed onto an FVB/N background; control mice were inbred FVB/N mice bred in the same unit. All experiments and analysis were performed blind to the genotype of the mice. Preparation and maintenance of acute hippocampal slices. A total of 47 Prnp +/+ and 49 Prnp0/0 age-matched male mice (3–9 weeks old) were anesthetized by intraperitoneal injection of a mixture of medetomidine (1 mg/kg) and ketamine (76 mg/kg), before being killed by cervical dislocation. The brains were rapidly removed and chilled (<3°C), in oxygenated, ice-cold sucrose-based cutting solution composed of (in mm) 189 sucrose, 26 NaHCO3, 1.2 NaH2PO4, 2.5 KCl, 0.1 CaCl2, 5 MgCl2, and 10 glucose. The brains were cut along the midline, and 300 μm horizontal hippocampal slices were cut using an Integraslice (Campden Instruments, Loughborough, UK). Hippocampal slices were maintained at room temperature in an interface storage chamber containing 95%O2–5%CO2 oxygenated aCSF. The composition of the artificial CSF (aCSF) was (in mm) 135 NaCl, 16 NaHCO3, 1.25 NaH2PO4, 3 KCl, 2 CaCl2, 1 MgCl2 and 10 glucose, pH 7.4. Slices were transferred to a recording chamber, where they were submerged and continually perfused (4–5 ml/min) with warm (29–31°C) aCSF, bubbled with 95%O2–5%CO2. Slices were allowed to equilibrate in the aCSF solution for >10 min before recording. Slices were changed after ∼1 h.
Whole-cell patch-clamp recordings were made from the somata of CA1 pyramidal neurons using infrared differential interference contrast on an Olympus (Tokyo, Japan) BX-51 upright microscope, fitted with a fluorplan 40×, 0.8 numerical aperture water-immersion lens (Micro Instruments, Long Hanborough, UK). CA1 neurons were visually selected based on appearance and the integrity of the apical dendrites (visible for ∼100 μm from the soma). Patch electrodes were pulled from borosilicate glass capillaries (outer diameter, 1.2 mm; inner diameter, 0.69 mm; Harvard Apparatus, Edenbridge, UK) using a P-97 horizontal puller (Sutter Instruments, Novato, CA) and filled with intracellular solution comprising (in mm) 135 KCH3SO4, 8 NaCl, 10 HEPES, 2 Mg-ATP and 0.3 Na-GTP; adjusted to pH 7.3 with KOH (∼285 mOsm), unless stated otherwise. For the VGCC studies, equimolar CsCH3SO4 replaced KCH3SO4 and 1 μm tetrodotoxin was added to the extracellular solution to reduce Na+ channel activation. For some VGCC studies, the standard aCSF was replaced by a tetraethylammonium chloride (TEA)-based extracellular solution containing (in mm) 148 TEA-Cl, 4 KCl, 2 CaCl2, 1 MgCl2, 10 HEPES, and 0.001 TTX, pH 7.3 with TEA-OH (298 mOsm). Patch electrodes filled with the intracellular solutions typically had resistances of 4–7 MΩ. Membrane potentials and currents were recorded using an NPI SEC-10L amplifier (Scientifica, Harpenden, UK), acquired and digitized at 10 kHz using a Power 1401 A–D converter (Cambridge Electronic Design, Cambridge, UK). Data were low-pass Bessel filtered at 1 kHz by either a Neurolog NL-125 or NL-135 filter unit (Digitimer, Welwyn Garden City, UK) before storage on a computer. Data acquisition and stimulus parameters were controlled using Signal software (version 2.16; Cambridge Electronic Design). To minimize complications associated with diffraction of fluorescent light associated with alterations in cell depth, care was taken to ensure that the same criteria (cell soma; 15–25 μm, < 50 μm depth from slice surface) for cell selection were used to identify CA1 pyramidal neurons used for the Fura-2 calibration experiments. No systematic differences in the K d were found between Prnp +/+ and Prnp0/0 neurons (data not shown). Analysis of endogenous Ca2+ buffering. where [B] and K d are the concentration and dissociation constant of Fura-2, respectively (Helmchen et al., 1996). where Δ[Ca2+]T is the increase in total Ca2+ (free and bound) and γ is the Ca2+ extrusion rate. Equations 3 and 4 predict that increases in κB will reduce the amplitude and slow the decay kinetics of the Ca2+ transient. Both the inverse of the amplitude (A −1) and τ depend linearly on κB. The relationship between A −1 and κB allows estimation of the endogenous Ca2+ binding ratio (κS), as the negative abscissa intercept. κS then allows estimation of γ from Equation 4. Added buffer measurements were performed on slices from mice over a narrow age range (postnatal days 42–55) to avoid any impact of age (Maravall et al., 2000). DM-nitrophen (Calbiochem, La Jolla, CA) was used as the caged compound for photorelease of Ca2+ and was dissolved directly in internal solution in which Mg-ATP was replaced with Na-ATP to avoid Mg2+ loading (Faas et al., 2005). DM-nitrophen (10 mm) was 60–70% loaded with Ca2+. The resulting free [Ca2+] was calculated to be ∼80 nm using the MaxChelator program. The lamp used for photolysis was a pulsed xenon arc lamp (Cairn Research); flash intensity was controlled by use of a variable capacitance system (20–4070 μF; 400V). The flash illuminated the entire field of view and discharged in <2 ms. For the flash photolysis experiments, it was necessary to use the longer wavelength indicator Fluo-3 (100 μm) to monitor [Ca2+]i because the UV illumination required to excite Fura-2 fluorescence would also photolyse the DM-nitrophen. For the flash photolysis experiments, because Fluo-3 is not a ratiometric dye, changes in intracellular Ca2+ were not calibrated and are expressed as ΔF/F 0. All values are expressed as mean ± SEM. Curve fitting was performed in Origin 8 (Silverdale Scientific, Stoke Mandeville, UK); statistical analysis was performed in SPSS 13 (SPSS, Woking, UK). Student's t tests and ANOVA were used as appropriate and the significant criterion was p < 0.05, unless otherwise stated. To understand the role of prion protein in Ca2+ signaling, we examined the relationship between the AHP and Ca2+ signaling using a combined electrophysiological and microfluorimetric approach. Previous studies have shown that Prnp0/0 neurons have a reduced AHP (Colling et al., 1996; Herms et al., 2001; Mallucci et al., 2002; Fuhrmann et al., 2006). Whole-cell patch clamp recordings were made from the somata of CA1 pyramidal neurons and AHPs were evoked either by repetitive action potential firing or by direct activation of voltage-gated Ca2+ channels. Figure 1 A illustrates typical AHPs recorded from Prnp +/+ and Prnp0/0 neurons in response to 50 action potentials (delivered at 20Hz). The slow AHP was significantly smaller in Prnp0/0 neurons than in Prnp +/+ neurons (2.19 ± 0.13 mV, n = 17; 3.05 ± 0.18 mV, n = 19, respectively) (Fig. 1 A). When the slow AHP current (I sAHP) was evoked by activation of voltage-gated Ca2+ channels by a depolarizing pulse in voltage-clamp mode, the I sAHP was significantly smaller in Prnp0/0 neurons than in Prnp +/+ neurons (85.5 ± 13.5 pA and 201.8 ± 25.3 pA, respectively) (Fig. 1 B). The apparent reduction in the medium AHP was attributable to the reduction in the underlying slow AHP (supplemental data part 2, available at www.jneurosci.org as supplemental material). A , Prnp0/0 neurons possess a reduced slow afterhyperpolarization. Ai , A train of 50 action potentials at 20 Hz, evoked both a medium and slow AHP in Prnp +/+ (black traces) and Prnp0/0 (gray traces) neurons. The medium AHP was defined by its rapid kinetics and was observed immediately after cessation of action potential firing. The slow AHP was defined by its slower kinetics and was smaller in Prnp0/0 neurons at all frequencies tested ( Aii ). B , A 300 ms depolarization from −65 to +5 mV activated both a medium AHP current (I mAHP), which displayed faster kinetics and was observed immediately after cessation of the depolarization and slow AHP current (I sAHP) which displayed slower kinetics. Similar to the slow afterhyperpolarization, the I sAHP was smaller in Prnp0/0 neurons. ***p < 0.001. We have confirmed that Prnp0/0 neurons display a selective reduction in the slow AHP in CA1 pyramidal neurons. The slow AHP is mediated by Ca2+-dependent K+ channels that are activated by Ca2+ entry through VGCCs (Sah and Faber, 2002), suggesting several mechanisms for the reduction in the slow AHP amplitude. These include altered Ca2+ channel function (Fuhrmann et al., 2006), altered Ca2+ signaling (Herms et al., 2000) and altered K+ channel function. To test the hypothesis that functioning of the K+ channel that is responsible for the slow AHP is altered in Prnp0/0 mice, we used photorelease of calcium from DM-nitrophen to elevate intracellular [Ca2+] independently of Ca2+ channel activation. This method is well established in the investigation of the molecular basis of the slow AHP (Lancaster and Zucker, 1994; Sah and Clements, 1999). Action potential firing (50 action potentials at 20 Hz), evoked slow AHPs in both Prnp +/+ and Prnp0/0 neurons. Prnp +/+ neurons had a slow AHP of 2.44 ± 0.38 mV (n = 5) (Fig. 2 A, left). Ca2+ concentration, as reported by changes in Fluo-3 fluorescence, increased throughout the period of action potential firing reaching a peak fluorescence value of 1.24 ± 0.06 (Fig. 2 B, left). 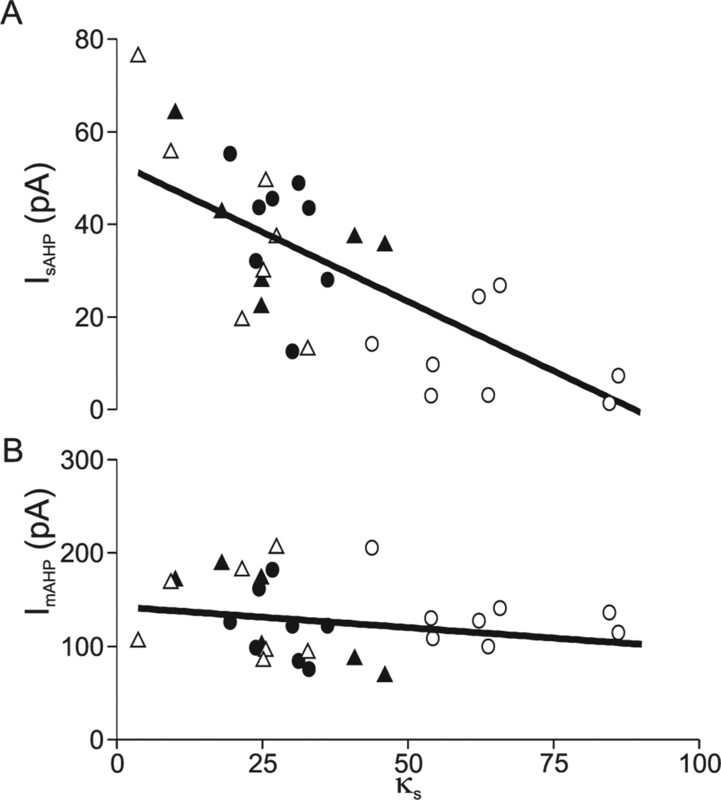 Prnp0/0 neurons generated a significantly smaller slow AHP (1.24 ± 0.31 mV; n = 6; p < 0.05) (Fig. 2 A, left). Furthermore, Prnp0/0 mice produced significantly smaller Ca2+ increases in response to action potential firing (peak fluorescence value, 1.10 ± 0.02, p < 0.05) (Fig. 2 B, left). Therefore, under the recording conditions necessary for flash photolysis studies, it is possible to replicate the reduced slow AHP amplitude in Prnp0/0 neurons. In Prnp +/+ neurons, flash photolysis of DM-nitrophen evoked a rapid increase in Ca2+ concentration (peak value, 1.82 ± 0.14) (Fig. 2 B, right) and a concomitant membrane hyperpolarization of 3.23 ± 0.36 mV (Fig. 2 A, right). In Prnp0/0 neurons, flash photolysis released similar amounts of Ca2+ as in wild-type neurons (peak value, 1.74 ± 0.07; p = 0.58); the decay rate of the Ca2+ signal did not significantly differ between Prnp +/+ and Prnp0/0 neurons (τdecay 2.73 ± 1.06 s, n = 5 and 2.55 ± 0.96 s, n = 6, respectively; p = 0.76). The hyperpolarization observed in response photorelease of Ca2+ was not significantly different in Prnp0/0 mice (3.12 ± 0.66 mV; p = 0.89). The hyperpolarization activated by flash photolysis of caged Ca2+ was confirmed as a slow AHP, because it was inhibited by 5-hydroxytryptamine (10 μm). Moreover, the flash evoked hyperpolarization displayed similar kinetics to the action potential evoked AHPs (supplemental data, part 2, available at www.jneurosci.org as supplemental material). The reduced slow AHP is not caused by alterations in the underlying K+ channels. Whole-cell recordings were obtained using electrodes filled with internal solution including 100 μm Fluo-3 and 10 mm DM-nitrophen (Ca2+ cage). A , B , Prnp0/0 neurons filled with this solution displayed a significantly reduced action potential evoked slow AHP ( A , left, gray traces), associated with a significant attenuation of Ca2+ increases ( B , left, gray traces). In contrast, flash photolysis evoked a robust and similar AHP in both Prnp +/+ and Prnp0/0 neurons ( A , right), associated with similar Ca2+ transients in the two genotypes ( B , right). *p < 0.05. The AHP in Prnp0/0 neurons was smaller only when activated by Ca2+ entry through Ca2+ channels, but not by homogeneous Ca2+ elevation resulting from photolysis of intracellular DM-nitrophen. The direct activation of the K+ channels underlying the slow AHP reveals, for the first time, that they are both present and functioning correctly in Prnp0/0 neurons. Therefore, alterations in K+ channel function cannot explain the observed reduction of slow AHP amplitude. Several studies have implicated changes in Ca2+ homeostasis in the absence of PrP (Herms et al., 2000, 2001; Brini et al., 2005; Fuhrmann et al., 2006). The flash photolysis study (Fig. 2 B, left), suggested that Ca2+ homeostasis was altered in the present study. Here we have used single cell fluorimetry with Fura-2 specifically to examine the role of prion protein in Ca2+ signaling and buffering. Resting Ca2+ levels in Prnp0/0 neurons were lower in both dendritic (Prnp +/+, 148.2 ± 23.8 nm; Prnp0/0 , 62.2 ± 21.4 nm; p = 0.01) and somatic regions (86.9 ± 16.1 nm; Prnp0/0 , 39.5 ± 10.7 nm; p = 0.03) (Fig. 3 C). Ca2+ signaling is perturbed in Prnp0/0 neurons. A , Prnp0/0 neurons (gray traces) produce weaker Ca2+ transients, in both somatic (left) and dendritic regions (right), in response to 50 action potentials evoked at 20 Hz. B , Peak Ca2+ changes were significantly reduced across the frequency range (p < 0.001, ANOVA; •, Prnp +/+; ○, Prnp0/0 ) for both somatic (left) and dendritic (right) regions. C , The resting Ca2+ level was significantly reduced in Prnp0/0 neurons in both the somatic (left) and proximal dendritic (right) regions. Somatic and dendritic regions were not significantly different. *p < 0.05; **p < 0.01; ***p < 0.005. Stimulating cells with 50 action potentials at 20 Hz evoked increases in intracellular Ca2+ in both the somatic (Fig. 3 A; left panel) and the proximal dendrite regions (Fig. 3 A, right panel), with the peak Ca2+ concentration occurring at the end of the spike train. The evoked peak [Ca2+] significantly increased with action potential frequency in both somatic and dendritic regions (Fig. 3) (ANOVA p = 0.01 and 0.03, respectively). 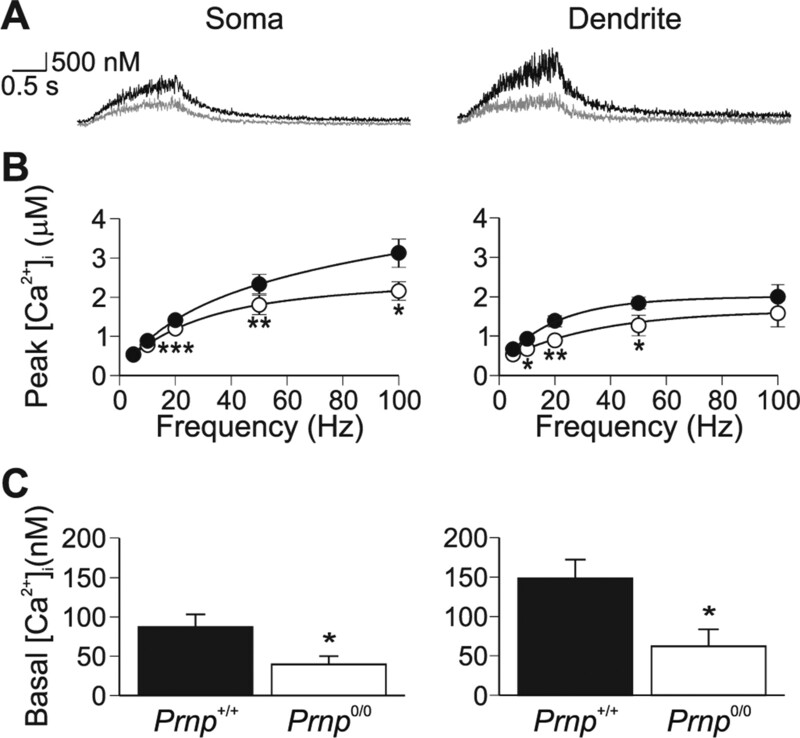 ANOVA revealed that the peak Ca2+ increases in Prnp0/0 neurons were smaller across a range of frequencies in both the soma and dendrites (p < 0.001). We chose to use 50 action potentials at 20 Hz as the standard stimulation protocol because the effective Ca2+ range for Fura-2 is ∼20 nm–2 μm and both 50 and 100 Hz resulted in Ca2+ increases in excess of 2 μm (Fig. 3 B). Ca2+ increases evoked by 50 action potentials at 20 Hz in the dendrites were smaller in Prnp0/0 cells than in wild type (0.88 ± 0.11 μm, n = 10 and 1.37 ± 0.14 μm, n = 12, respectively; p < 0.01) (Fig. 3 A). The peak Ca2+ response was similarly smaller in the soma: 1.19 ± 0.10 μm, n = 16 in Prnp0/0 and 1.41 ± 0.06, n = 21 in wild type (p < 0.005). The observed alterations in Ca2+ signaling could be explained by changes in VGCC function, as has been reported previously for CA1 pyramidal neurons (Fuhrmann et al., 2006). We investigated this possibility by comparing the voltage dependence of VGCC currents and simultaneously measured Ca2+ transients from both Prnp +/+ and Prnp0/0 neurons. Neurons were voltage clamped at −70 mV and 200 ms step depolarizations (−60 mV to + 30 mV; 10 mV increments) were applied every 30 s. No differences in the I–V relationships were observed between Prnp +/+ and Prnp0/0 neurons whether in bicarbonate-buffered aCSF (p = 0.89) (Fig. 4 A,B) or HEPES-buffered aCSF (p = 0.69) (supplemental data part 4, available at www.jneurosci.org as supplemental material). Ca2+ changes evoked by step depolarizations, however, were significantly smaller in Prnp0/0 than in Prnp +/+ neurons (1.37 ± 0.18 μm and 2.36 ± 0.32 μm, respectively; p = 0.03) (Fig. 4 A). We have therefore excluded the possibility that the alteration in slow AHP is caused by alterations in either K+-channel or Ca2+-channel function. Voltage-gated Ca2+ channels are unaffected in Prnp0/0 neurons. A , Ca2+ current amplitude and kinetics were unaffected in Prnp0/0 neurons in response to a 200 ms step depolarization. The Ca2+ changes, as monitored by 100 μm Fura-2, were significantly smaller in Prnp0/0 neurons (bottom, gray trace) than in Prnp +/+ neurons (for statistics, see Results). B , Ca2+ current-voltage relationship is not altered in Prnp0/0 neurons (•, Prnp +/+; ○, Prnp0/0 ). We used the “added buffer” technique (Neher, 1995) to investigate whether the PrP-dependent differences in Ca2+ signaling, found in this and other studies (Herms et al., 2000; Brini et al., 2005; Fuhrmann et al., 2006), could be explained by changes in endogenous Ca2+ binding capacity. Diffusion of Fura-2 from the patch pipette provided controlled loading of Ca2+ buffer into the neurons, with simultaneous recording of calcium responses triggered by somatic depolarization (50 ms duration −65 to +5 mV, every 30 s). During Fura-2 loading, the concentration of exogenous Ca2+ buffer progressively increases and eventually dominates; the relationship of the Ca2+ response with the concentration of Fura-2 allows estimation of Ca2+ buffering extrusion (Eqs. 3, 4) (Neher, 1995; Helmchen et al., 1996; Palecek et al., 1999). Fura-2 concentration was estimated from changes in the fluorescence intensity recorded at the isobestic wavelength (358 ± 3 nm in our system), measured every 30 s after establishment of a gigaohm seal (Fig. 5 Ai,Aii). The time course of Fura-2 loading was best fit by a single exponential, and did not differ between wild-type (time constant, 2.8 ± 0.4 min, n = 8) and Prnp0/0 neurons (time constant, 2.6 ± 0.2 min, n = 8) (Fig. 5 Ai,Aii, supplemental Fig. 1B, available at www.jneurosci.org as supplemental material). The concentration of Fura-2 was converted to Fura-2 binding ratio (κ'B) according to the method of Helmchen et al. (1996). Initial series resistance varied between 8 and 12 MΩ; cells were excluded from buffering analysis if the resistance changed by >20% during the recording period. Somatic Ca2+ transients were evoked by a 50 ms depolarization every 30 s. Ca2+ increases evoked by this stimulation protocol were stable throughout the duration of the Ca2+ buffering experiments (supplemental Fig. 1C, available at www.jneurosci.org as supplemental material). Endogenous Ca2+ buffering is enhanced in Prnp0/0 neurons. 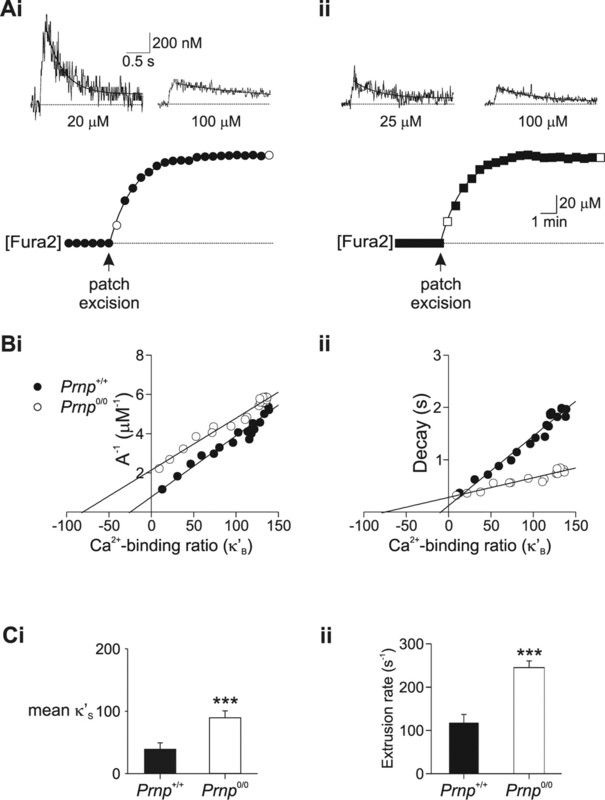 Calcium buffering of CA1 neurons was assessed by monitoring calcium changes during Fura-2 loading. Ai , The soma of a Prnp +/+ CA1 pyramidal neuron was loaded with 100 μm Fura-2 (bottom). Measurements of depolarization-evoked somatic [Ca2+]i transients were made every 30 s during loading (filled circles). [Ca2+]i transients measured directly after patch excision and after full loading (open circles) are shown in the top. The Ca2+ transients decayed with time courses of 0.37 and 1.82 s, respectively. Aii , Ca2+ buffering analysis for a Prnp0/0 neuron during loading with 100 μm Fura2 (bottom). The Ca2+ transients measured immediately after patch excision and after full loading (top, open square), decayed with time courses of 0.316 and 0.828 s, respectively. Bi , Inverse amplitude of Ca2+ changes plotted as a function of Fura-2 Ca2+ binding ratio (κ'B) for individual cells. Negative x-axis intercepts were 25 (Prnp +/+; •) and 81 (Prnp0/0 ; ○). Bii , Decay time constant (τ) plotted as a function of Fura-2 Ca2+ binding ratio (κ'B). Negative x-axis intercepts were 10 (Prnp +/+) and 75 (Prnp0/0 ), which is a measure of the ability of the neuron to buffer free Ca2+. Ci , Plot of mean endogenous binding Ca2+ binding ratio (κS) derived from inverse amplitude illustrating improved Ca2+ buffering in Prnp0/0 neurons (means of 8 Prnp +/+ and 8 Prnp0/0 cells). Cii , Plot of mean Ca2+ extrusion rate (γ) obtained from Equation 4 showing increased Ca2+ extrusion in Prnp0/0 neurons. ***p < 0.01. Analysis of the amplitude and the decay of the Ca2+ transients from eight wild-type and eight Prnp0/0 neurons during loading with 100 μm Fura-2 showed that both inverse amplitude and decay rate depended on κ'B and were best fit by a linear regression (Fig. 5 B, supplemental Fig. 1D, available at www.jneurosci.org as supplemental material). The integral of the Ca2+ change was independent of κ'B (similar to Helmchen et al., 1996) (supplemental Fig. 1Diii, available at www.jneurosci.org as supplemental material). The intercept of the regression line with the ordinate (κ'B = 0) provides an estimate of both the Ca2+ change and kinetics in the absence of exogenous buffer. The negative abscissa intercept provides an estimate of the endogenous binding capacity (κS) (Helmchen et al., 1996). κS estimated from the inverse amplitude of the Ca2+ increase (A −1) (Fig. 5 Bi) showed that Prnp0/0 neurons had a greater Ca2+ buffering capacity (Prnp +/+: 38 ± 10; Prnp0/0 : 89 ± 11, p < 0.005). Estimates of the Ca2+ signaling profile in the absence of exogenous buffering showed that the peak increase was significantly smaller in Prnp0/0 neurons than in Prnp +/+ neurons (0.51 ± 0.05 μm and 1.10 ± 0.13 μm, respectively, p < 0.001). The decay rate at κ'B = 0 was significantly slower in Prnp0/0 neurons than wild type (0.37 ± 0.03 s and 0.22 ± 0.03 s, respectively, p < 0.005). The Fura-2 loading experiments also allow estimation of κS by analyzing the depolarization evoked fluorescence decrements (ΔF 380). κS can be obtained by expressing the fluorescence decrements ΔF 380 as a function of κ'B (Helmchen et al., 1996). Estimates of κS suggested that Prnp0/0 neurons (78 ± 13) have greater buffering capacity than wild-type neurons (38 ± 6, p < 0.05) (data not shown), consistent with the results from the inverse amplitude method. The above Ca2+ buffering experiments are based on a one-compartment model and rely on the assumption that the decay of the Ca2+ signal is described by a single extrusion rate (Eq. 4). This assumption is supported by the observation that the decay of the Ca2+ transient was described by a single exponential (Fig. 5). Furthermore, the decay rate depended linearly on κB as predicted by Equation 4 (Fig. 5 Bii). The extrusion of Ca2+ (γ) is a function of multiple mechanisms including active Ca2+ transport across the plasma membrane and uptake into intracellular organelles including the endoplasmic reticulum (ER) and mitochondria. Estimating γ from Equation 4 gave an extrusion rate for Prnp +/+ neurons of 123 ± 16 s−1 (n = 8). In contrast, the extrusion rate for Prnp0/0 neurons was significantly faster (240 ± 23 s−1; n = 8; p < 0.001) (Fig. 5 D), suggesting that Prnp0/0 neurons have an enhanced extrusion mechanism. We explored the mechanisms responsible for the increased Ca2+ buffering capacity and the consequent reduction in slow AHP in Prnp0/0 mice. Ca2+ buffering mechanisms in neurons include: extrusion across plasma membrane, binding to mobile and immobile cytoplasmic buffers and uptake into intracellular stores such as mitochondria and endoplasmic reticulum (Neher, 1998). The ER functions as a major Ca2+ uptake mechanism in neurons (Neering and McBurney, 1984; Sabatini et al., 2002; Usachev et al., 2006). This functional role for the ER coupled with the observations that PrP is widely expressed in the ER (Holscher et al., 2001), and that the ER has been implicated in the aberrant response of Prnp0/0 neurons to oxidative stress (Krebs et al., 2007), led us to hypothesize that changes in the function of the ER may underlie the observed alterations in Ca2+ homeostasis. We examined the contribution of Ca2+ uptake into the ER by inhibiting the major ER Ca2+ uptake mechanism, the sarcoplasmic/endoplasmic reticulum pump Ca2+-ATPase (SERCA), with either thapsigargin or cyclopiazonic acid (CPA). Neurons were loaded with 100 μm Fura-2 for 10 min to allow the dye to equilibrate between the patch pipette and cell (Fig. 5 A). Then, using the standard stimulation protocol of 50 action potentials delivered at 20 Hz, changes in slow AHP, basal and peak Ca2+ levels were monitored while the slice was perfused with 3 μm thapsigargin. Before application of thapsigargin the slow AHP, basal Ca2+ levels and peak Ca2+ change were significantly smaller in Prnp0/0 neurons (Fig. 6 A). Application of thapsigargin, increased the amplitude of the slow AHP, and both basal and peak Ca2+ changes within 4 min (Fig. 6 A), and abolished the difference between the responses from Prnp0/0 and control neurons (Fig. 6 B,C). To confirm that the reversal of the slow AHP and Ca2+ signaling was the result of inhibition of SERCA, we examined the effect of a second inhibitor of SERCA, CPA, on the amplitude of the slow AHP. Similar to thapsigargin (Fig. 6 A), CPA did not affect the amplitude of the slow AHP in Prnp +/+ neurons (control, 2.5 ± 0.3 mV; 10 μm CPA, 2.3 ± 0.3, n = 5; p = 0.42) (supplemental Fig. 2, available at www.jneurosci.org as supplemental material). In contrast, the amplitude of the slow AHP in Prnp0/0 neurons, was initially significantly smaller than in Prnp +/+ neurons (control, 1.5 ± 0.3 mV; p < 0.05). Application of 10 μm CPA increased the amplitude of the slow AHP to 2.4 ± 0.5 mV (n = 5), which did not significantly differ from Prnp +/+ neurons in the presence of CPA (p = 0.9). Similarly, CPA (10 μm) increased the amplitude of I sAHP in Prnp0/0 neurons (control 43.5 ± 5.9 pA, CPA 105.8 ± 24.8 pA, n = 4, p < 0.05), but not in Prnp +/+ neurons (control 127.4 ± 17.8 pA, CPA 108.1 ± 9.1 pA). Block of SERCA by thapsigargin abolishes the observed changes in slow AHP and Ca2+ signaling Prnp0/0 neurons. A , Bath application of thapsigargin (3 μm) increased slow AHP amplitude (top), peak Ca2+ levels (middle), and basal Ca2+ levels in Prnp0/0 neurons (open circles), but not Prnp +/+ neurons (filled circles). B , C , Representative traces of voltage response ( B ) and Ca2+ changes ( C ) evoked by 50 action potentials at 20 Hz; control responses are shown in the left panel, thapsigargin treated responses are illustrated in the right panel (Prnp0/0 in gray; Prnp +/+ in black). *p < 0.05; **p < 0.01; ***p < 0.005. These data suggest that the observed differences from Prnp0/0 neurons are the result of an alteration in SERCA activity. To examine the role of SERCA in Ca2+ buffering further, we used the added buffer method described above. Neurons were pretreated with thapsigargin (3 μm) for 10 min before establishing a whole-cell recording and performing an added-buffer experiment. In thapsigargin naive neurons, the I sAHP, basal Ca2+ and peak Ca2+ levels were significantly smaller in Prnp0/0 neurons than control (Fig. 7 A, Table 1). In contrast, these responses in thapsigargin pretreated Prnp0/0 neurons were not significantly different from Prnp +/+ responses (Fig. 7 A, Table 1). Thapsigargin-naive Prnp0/0 neurons showed a significantly greater κS (estimated from the inverse amplitude) than control neurons (80 ± 9 and 37 ± 7, respectively; n = 11) (Fig. 5). Inhibition of SERCA by thapsigargin did not affect κS in control neurons (28 ± 5; n = 8; p = 0.37). In contrast, inhibition of SERCA by thapsigargin significantly shifted the κS in Prnp0/0 neurons (19 ± 4; n = 7; p < 0.001) (Fig. 7 B,C), toward that observed in control neurons. Calculation of the extrusion rate revealed that pretreatment with thapsigargin reversed the increase in extrusion rate observed in Prnp0/0 neurons (thapsigargin naïve, 240 ± 23 s−1; thapsigargin, 51 ± 11 s−1; p < 0.001). In contrast, thapsigargin did not alter the extrusion rate in Prnp +/+ neurons significantly (thapsigargin naïve, 123 ± 16 s−1; thapsigargin, 84 ± 10 s−1; p = 0.08). Block of SERCA by thapsigargin abolishes the observed changes in slow AHP, Ca2+ signaling, and Ca2+ buffering in Prnp0/0 neurons. 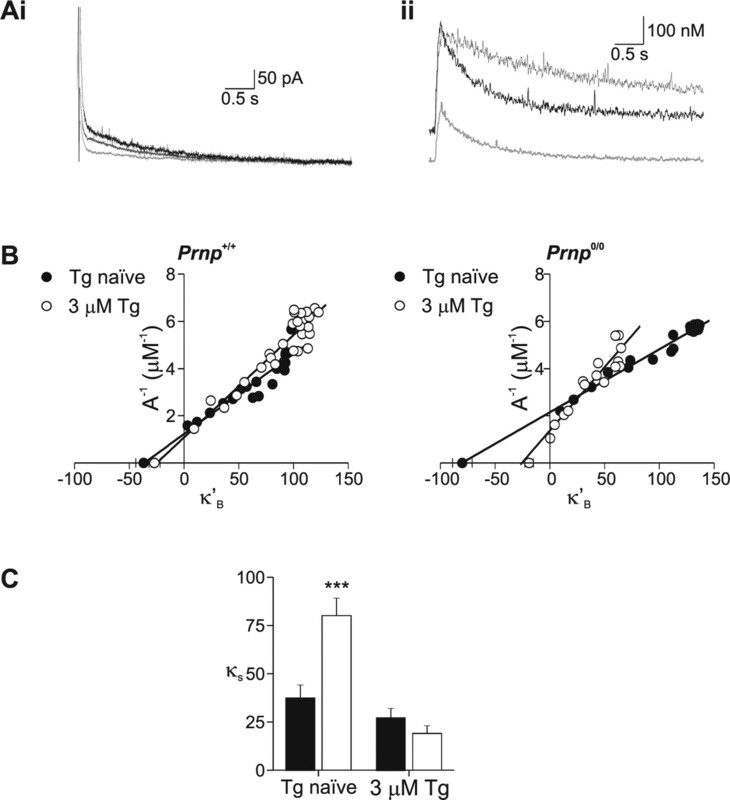 To examine the role of the ER in buffering, the added buffer experiments were repeated in neurons that were either under control conditions (Tg naive) or pretreated with thapsigargin (3 μm). A , In Prnp0/0 neurons, the reduction in both slow AHP ( Ai , light gray traces) and Ca2+ signaling ( Aii , light gray traces) was abolished by pretreatment with thapsigargin (3 μm; Ai , Aii , dark gray traces). B , C , Concomitant with these changes, the increase in the buffering capacity was also abolished. Buffering capacity was estimated from the inverse amplitude because blockade of SERCA alters Ca2+ decay kinetics. p < 0.005. The endoplasmic reticulum provides a substantial mechanism for sequestration of action potential induced Ca2+ entry as blocking SERCA slows the decay of the Ca2+ signal (Sabatini et al., 2002). In the present study, inhibition of SERCA by thapsigargin resulted in an approximate twofold (1.92 ± 0.14; n = 10) slowing of the decay of the Ca2+ signal in Prnp +/+ neurons. In contrast, inhibition of SERCA in Prnp0/0 neurons resulted in a significantly greater slowing of the Ca2+ decay time constant (2.84 ± 0.34; n = 13; p = 0.04), supporting the hypothesis that Ca2+ buffering is enhanced in Prnp0/0 neurons as a result of enhanced SERCA activity. Similar results were observed when 300 nm thapsigargin was applied to neurons (data not shown). The observation that the reduction in the slow AHP in Prnp0/0 neurons could be rapidly reversed by inhibition of SERCA by either thapsigargin or CPA, in parallel with changes in the endogenous buffering, suggested that the κs could be used to predict the amplitude of the afterhyperpolarization. A plot of κs versus I sAHP amplitude confirmed a linear relationship (Fig. 8 A) (regression significant at p < 0.001). This relationship was maintained between genotypes and also for neurons that were pretreated with thapsigargin. A plot of ImAHP amplitude versus κs revealed no correlation (Fig. 8 B) (regression, p = 0.21). Slow afterhyperpolarization amplitude is correlated with endogenous buffering capacity. A , Plot of slow AHP amplitude versus endogenous buffering capacity (κs) reveals a linear relationship (coefficient of determination 0.54; p < 0.001). B , The medium AHP was not correlated to endogenous buffering capacity (coefficient of determination 0.022; p = 0.21). Filled symbols, Prnp +/+; open symbols, Prnp0/0 ; circles, thapsigargin naive; triangles, pretreated with 3 μm thapsigargin. Previous studies of the functional role of PrP have reported that PrP-deficient (Prnp0/0 ) mice have smaller slow afterhyperpolarizations (Colling et al., 1996; Herms et al., 2001). This reduction in Ca2+-activated K+ current could arise from impairments of: Ca2+ channels, K+ channels, or Ca2+ signaling. We identified the mechanisms responsible for the reduced AHP using a combined microfluorimetric and electrophysiological approach in CA1 pyramidal neurons. We found no differences in Ca2+ currents (Herms et al., 2000; cf. Fuhrmann et al., 2006) and conclude that the weaker slow AHP must have another cause. To date, deficits in K+ channel function have not been directly examined. If the slow AHP deficit is caused by alteration in K+ channel function, this may arise because of alterations in the K+ channel itself or to alterations in the putative Ca2+ sensor for the slow AHP, hippocalcin (Tzingounis et al., 2007). 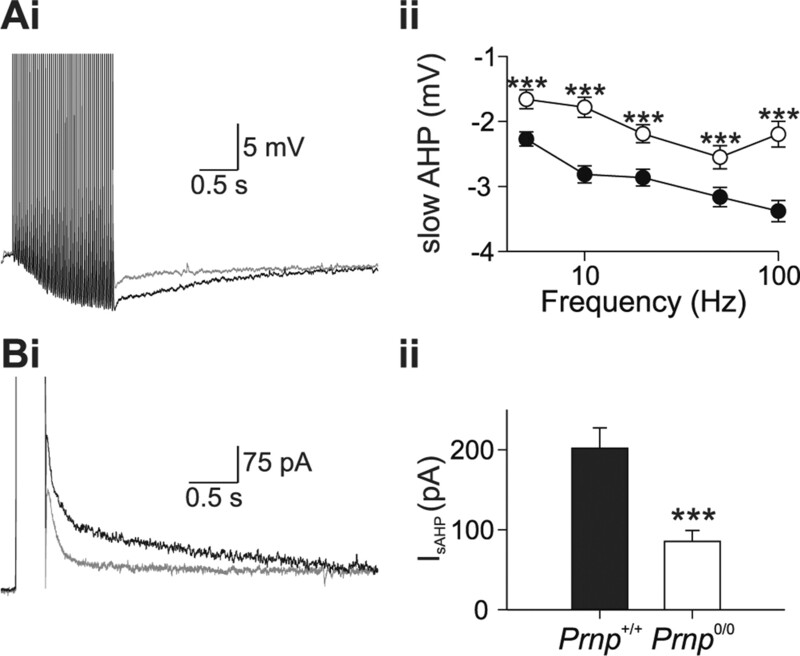 Direct activation of the Ca2+-dependent K+ channels by photorelease of caged Ca2+ evoked comparable AHPs in both Prnp +/+ and Prnp0/0 pyramidal neurons, despite the latter having significantly smaller action potential evoked slow AHPs. We therefore conclude that neither disruption of K+ channels nor alteration in the expression of the Ca2+ sensor is responsible for the reduction in AHP amplitude. The most likely explanation remaining is that Prnp0/0 neurons have altered Ca2+ homeostasis, as suggested previously (Herms et al., 2000). In the present study, we found a decrease in Ca transients evoked by depolarization. We used the added buffer method to investigate this in detail (Neher, 1995; Fierro and Llano, 1996; Helmchen et al., 1996) and found that the observed alterations in Ca2+ signaling can be explained by increases in intracellular buffering and clearance of Ca2+. The observation that the SERCA inhibitor, thapsigargin, abolished the increases in both buffering (κS) and clearance (γ) in Prnp0/0 neurons suggested that the differences were caused by changes in the ER. The role of SERCA is to pump Ca2+ into the ER, resulting in Ca2+ clearance, but it also acts as a Ca2+ buffer (Higgins et al., 2006); both of these functions are inhibited by thapsigargin or CPA (Tadini-Buoninsegni et al., 2008). We conclude that changes in SERCA can explain increases in both buffering and clearance in the Prnp0/0 neurons. Aberrant ER function has been suggested previously to underlie alterations in the response of Prnp0/0 neurons to oxidative stress (Krebs et al., 2007). Altered SERCA function may explain other phenotypes in Prnp0/0 mice, for instance impaired LTP (Collinge et al., 1994): SERCA activity has been implicated in the induction of LTP (Harvey and Collingridge, 1992; Bardo et al., 2006), perhaps related to its effects on dendritic spine function (Scheuss et al., 2006). In summary, we have shown that Prnp0/0 neurons possess a reduced slow afterhyperpolarization that is a consequence of increased Ca2+ buffering in the endoplasmic reticulum resulting from increased SERCA activity. We propose that the increased Ca2+ buffering provides a mechanism for several previously reported phenotypes in prion null neurons. This work was supported by Biotechnology and Biological Sciences Research Council Project Grant 6/BS5 16776 to J.G.R.J. and J.C. We thank the members of the Department of Neurophysiology and Drs. Frank Michelangeli and Graham Jackson for invaluable discussions. The assistance of Karin Swerdya and Gail O'Brian in the maintenance of the mice colonies is gratefully acknowledged. (2006) The role of the endoplasmic reticulum Ca2+ store in the plasticity of central neurons. Trends Pharmacol Sci 27:78–84. (2005) The prion protein and its paralogue Doppel affect calcium signaling in Chinese hamster ovary cells. Mol Biol Cell 16:2799–2808. (2002) Copper and prion diseases. Biochem Soc Trans 30:742–745. (2001) Dose-dependent, prion protein (PrP)-mediated facilitation of excitatory synaptic transmission in the mouse hippocampus. Pflügers Arch 442:223–229. (2002) Cellular prion protein transduces neuroprotective signals. EMBO J 21:3317–3326. (1996) Hippocampal slices from prion protein null mice: disrupted Ca2+-activated K+ currents. Neurosci Lett 209:49–52. (1997) Mossy fibre reorganization in the hippocampus of prion protein null mice. Brain Res 755:28–35. (2001) Prion diseases of humans and animals: their causes and molecular basis. Annu Rev Neurosci 24:519–550. (2008) The chemistry of copper binding to PrP: is there sufficient evidence to elucidate a role for copper in protein function? Biochem J 410:237–244. (2005) Kinetic properties of DM-nitrophen binding to calcium and magnesium. Biophys J 88:4421–4433. (1996) High endogenous calcium buffering in Purkinje cells from rat cerebellar slices. J Physiol (Lond) 496:617–625. (2000) Ultrastructural localization of prion proteins: physiological and pathological implications. Microsc Res Tech 50:76–88. (2006) Loss of the cellular prion protein affects the Ca2+ homeostasis in hippocampal CA1 neurons. J Neurochem 98:1876–1885. (1992) Thapsigargin blocks the induction of long-term potentiation in rat hippocampal slices. Neurosci Lett 139:197–200. (1996) Ca2+ buffering and action potential-evoked Ca2+ signaling in dendrites of pyramidal neurons. Biophys J 70:1069–1081. (1999) Evidence of presynaptic location and function of the prion protein. J Neurosci 19:8866–8875. (2000) Altered intracellular calcium homeostasis in cerebellar granule cells of prion protein-deficient mice. J Neurochem 75:1487–1492. (2001) Prion protein affects Ca2+-activated K+ currents in cerebellar Purkinje cells. Neurobiol Dis 8:324–330. (2001) Prion protein contains a second endoplasmic reticulum targeting signal sequence located at its C terminus. J Biol Chem 276:13388–13394. (2006) A buffering SERCA pump in models of calcium dynamics. Biophys J 91:151–163. (2003) No superoxide dismutase activity of cellular prion protein in vivo. Biol Chem 384:1279–1285. (2005) Recombinant prion protein does not possess SOD-1 activity. Biochem J 392:309–312. (2007) Cellular prion protein modulates the intracellular calcium response to hydrogen peroxide. J Neurochem 100:358–367. (1986) Calcium-dependent current generating the afterhyperpolarization of hippocampal neurons. J Neurophysiol 55:1268–1282. (1994) Photolytic manipulation of Ca2+ and the time course of slow, Ca2+-activated K+ current in rat hippocampal neurones. J Physiol (Lond) 475:229–239. (2002) Post-natal knockout of prion protein alters hippocampal CA1 properties, but does not result in neurodegeneration. EMBO J 21:202–210. (1995) PrP gene dosage and long term potentiation. Neurodegeneration 4:113–114. (2000) Estimating intracellular calcium concentrations and buffering without wavelength rationing. Biophys J 78:2655–2667. (1984) Role for microsomal Ca storage in mammalian neurones? Nature 309:158–160. (1998) Usefulness and limitations of linear approximations to the understanding of Ca2+ signals. Cell Calcium 24:345–357. (1999) Calcium dynamics and buffering in motoneurones of the mouse spinal cord. J Physiol (Lond) 520:485–502. 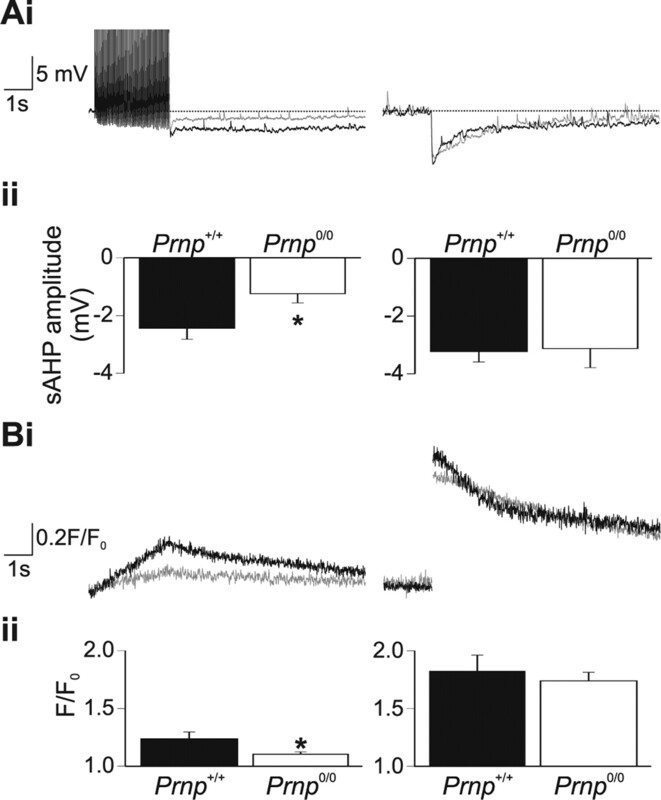 (2005) Specific enhancement of SK channel activity selectively potentiates the afterhyperpolarizing current IAHP and modulates the firing properties of hippocampal pyramidal neurons. J Biol Chem 280:41404–41411. (1998) Prions. Proc Natl Acad Sci USA 95:13363. (1997) The human 37-kDa laminin receptor precursor interacts with the prion protein in eukaryotic cells. Nat Med 3:1383–1388. (2002) The life cycle of Ca2+ ions in dendritic spines. Neuron 33:439–452. (1999) Photolytic manipulation of [Ca2+]i reveals slow kinetics of potassium channels underlying the afterhyperpolarization in hippocampal pyramidal neurons. J Neurosci 19:3657–3664. (2006) Nonlinear [Ca2+] signaling in dendrites and spines caused by activity-dependent depression of Ca2+ extrusion. J Neurosci 26:8183–8194. (2008) Effects of high-affinity inhibitors on partial reactions, charge movements and conformational states of the Ca2+ transport ATPase (sarco-endoplasmic reticulum Ca2+ ATPase) Mol Pharm 73:1134–1140. (2006) Activation of protein kinase C in sensory neurons accelerates Ca2+ uptake into the endoplasmic reticulum. J Neurosci 26:311–318. (2003) The prion protein and neuronal zinc homeostasis. Trends Biochem Sci 28:406–410.